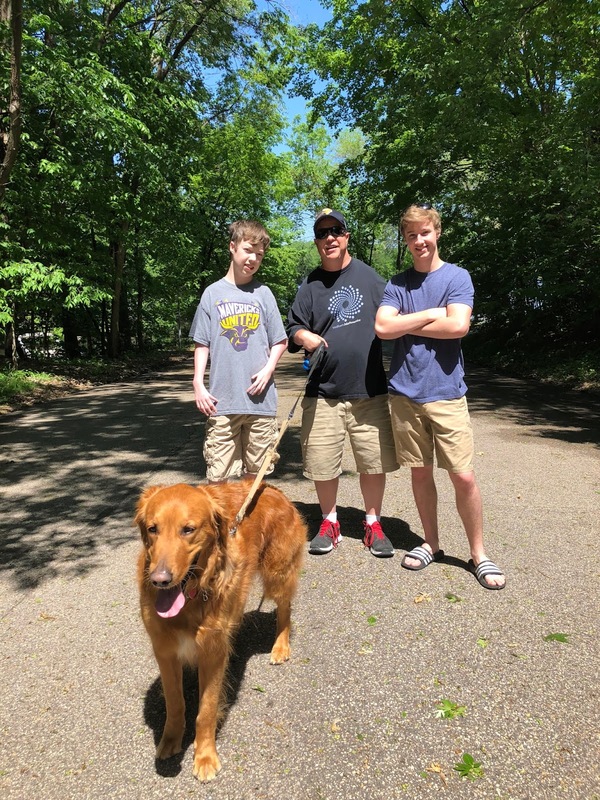 We've been having a great time so far this summer having our boys home. Oftentimes that's just doing stupid stuff like walking the dog, but it's just so much better when you can do it with the whole family. On Tuesday, Avery's girlfriend, Emma, came up to visit from Iowa City. We were very happy to see her and have her spend some time with us. We've had a heat wave this week in Minnesota, so getting the boat out and going tubing seemed like a good fix. I figured the kids must be really hot so I did everything I could to help them by getting them in the water. I was able to spin Sydney off a couple of times, but all the rest of the kids were able to hang on for the duration of the rides. Their loss. I'm sure that water was quite refreshing. The geese seemed to like cooling off in it anyways. On Friday night, we joined some friends at the American Legion in Savage for a little karaoke action. Saturday brought us to the St. Croix River for some cruising. Our old buddies, Karl & Tina Zitzewitz, invited us out for their maiden voyage this year. Responsible swimmers put on their sunscreen. I was happy to do so. It's always fun to see Bald Eagles fly overhead. I just hope they're not sizing me up as potential roadkill. Considering the temps were getting into the nineties, going boating seemed to be a pretty popular activity. We eventually cooled off by jumping in the water. It was quite refreshing. Unfortunately, Avery lost his right arm on the way down. It's always a fun day on the river with Captain Carl behind the wheel. On Sunday, we met up with our good friend, Orlando Mazzolini, to go hiking by the Minnesota River. I felt pretty good knowing that I was being led by a Mazzolini down Mazomani Trail. I felt like we are on an episode of Little House on the Prairie being out here. Where is Michael Landon when you need him? We like going on guided tours with Orlando. He always shows us little gems of adventures not far from where we live. Occasionally I get a little nervous following him, especially when he decides to start venturing off the trails. He thought we could get down to the river this way, but it was pretty obvious no human being had ever traveled here before. I was glad when he finally decided we should just turn around and head back to the trail. Eventually we found the main overlook and had some beautiful views of the Minnesota River. A nice way to spend a couple of hours on a Sunday morning. On Sunday night, we headed over to our old pals, the Walters family, for a bonfire. We were joined by several other good friends also. Whenever we get together as a group like this, Dan always wants to give everyone piggy back rides the whole night. He actually gets a little bit insistent about it. Eventually we all just decided to climb on and enjoy the ride.